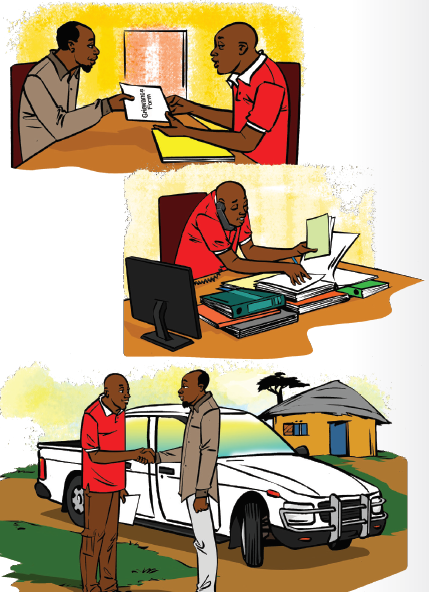 This Grievance procedure explains what to do if you have a complaint about the activities related to the East African Crude Oil Pipeline project or its contractor’s activities. 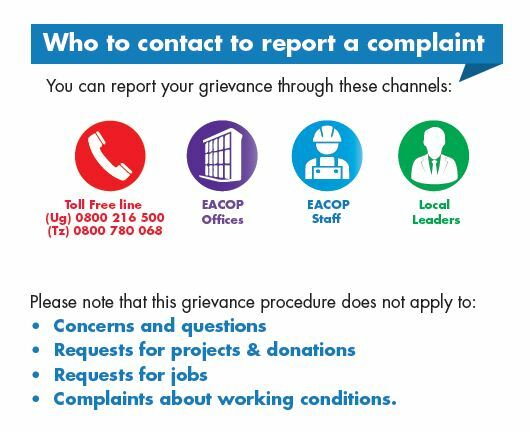 If you believe that the EACOP project is responsible for an unfair situation, you can report a complaint through the Community Liaison Officer (CLO) or other project staff. • If the Complaint can be resolved immediately, the CLO will take action to address the issue directly. • Once the corrective measure is implemented, you will sign a Grievance Acceptance and Closure form with the help of a CLO and you will be given a copy. • If the complaint cannot be resolved immediately, you will fill the Grievance form and await an acknowledgement within 7 days. • A solution will be proposed and implemented, if you agree. You will sign the Grievance Acceptance and Closure form and you will be given a copy. Note: If the investigation finds that the Complaint is unfounded, you will receive a letter explaining why the Complaint was refused. • If you have not agreed to the proposed solution within a month, a Grievance Management Committee will meet. • The Committee will include the project, and government representatives or other third parties.The Committee will study the complaint and your refusal and consider if another solution is appropriate. • If you agree, you will sign the Grievance Acceptance and Closure form. • If you do not accept the solution proposed by the committee, your complaint will be forwarded to the Appeal Committee who will consider proposing another solution. • If you accept the solution, you will sign the Grievance Acceptance and Closure form. • If you do not accept the solution, the complaint will be closed and you will receive a close out letter from the project. • The complaint will be handed over to the Project Legal Department. Once a solution is found and is acceptable to you, the corrective measure will be implemented. You will be asked to sign the close out section of the Grievance form to close the case. The Grievance Acceptance and Closure form is filled out and you will be given a copy. once a solution is found and is acceptable to you, the corrective measure will be implemented. You will be asked to sign the close out section of the Grievance form to close the case. The Grievance Acceptance and Closure form is filled out and you will be given a copy. 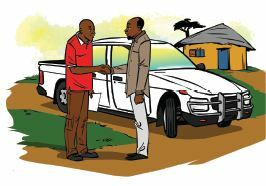 The Community Liaison Officer will be your contact person during the process of the grievance resolution. Please note, however, that he/she is not entitled to take any decision on behalf of the company.